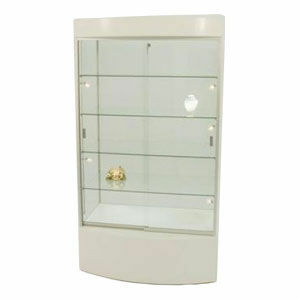 Dimensions: 40" x 23" x 73"
A pre-assembled, tempered glass, Rectangular Curved Wall Display. Shown in white glossy smooth finish with brushed silver anodized aluminum frame with optional microhalogen spotlights. Available in all standard finishes and custom finishes upon repuest, as well as color sprayed finishes.This product will be shipped VIA common carrier. Freight will be quoted separately. You will be notified of the freight amount.